A very large and celebrated Patron is held on the island and the shores of the lake on St. John's day, when numerous tents are pitched, and a kind of carnival is held, in which dancing and singing, interspersed with love-making, praying, and fighting, form the principal business of the meeting. As many of my readers may have never heard of the Irish Patron——or, as it is more generally pronounced, Pattern—it may be as well to explain to them that it is an assemblage of persons of both sexes at a particular place, for the performance of certain religious ceremonies and penances. The locality usually chosen is a "Holy Well," in all probability one of those which in the early Christian ages had been used by the priests for the purposes of baptism. Many of these have in their vicinity a hermitage, chapel, or tomb of the pious man whose sanctity attaches itself to the well, and whose waters in consequence are said to possess miraculous virtues in healing the sick and maimed. The time at which the believers in those wonderful cures resort to the health-giving font, is on the anniversary of the Patron saint of the well. On such occasions it is not unusual to see several thousand persons collected at a celebrated fountain, many with pious, but mistaken zeal, performing their painful penances on their bare knees around the holy well, for themselves or on behalf of their friends; for it is not unusual, when the penance is too severe for the strength or inclination of the principal, to have "the stations" as they call the routine of the performance, executed by proxy. The original intention of the Patron was evidently of a religious character, but in process of time it degenerated into a scene of gross riot and debauchery, which at length caused the suppression of these meetings by the Roman Catholic clergy. A little to the east of the island the waters issue from the lake, and form the head of the River Lee, which at this point is so shallow that it may be crossed by a few stepping-stones. From thence it pours its irregular course over huge ledges and masses of rock—now sweeping onward headlong, and now pausing in dark eddying pools through the rugged valley, until it reaches Lough Allua. Before quitting this neighbourhood I visited the Pass of Keimaneigh, which, for picturesque though gloomy grandeur, I have never seen surpassed, even in this region of romantic glens and mountain denies. Through this pass runs the highroad from Macroom to Bantry, having the appearance of being excavated between the precipitous crags, that, rising on either hand, assume the resemblance of fantastic piles and antique ruins, clothed with mosses and lichens, with here and there the green holly and ivy, contributing by the richness of their tints to the beauty of the scene. Even the arbutus, which by many is supposed to be peculiar to Killarney, is found here interspersed through the overhanging rocks. "We behold with wonder," says an agreeable writer, "this and the ash, and other hardy plants and shrubs, growing at immense heights overhead—tufting crags, inaccessible to the human foot, while we are astonished to think how they got there. The London-pride grows here, and on the surrounding mountains, as well as amongst the ruins of Gougaune Barra, in the most astonishing profusion. 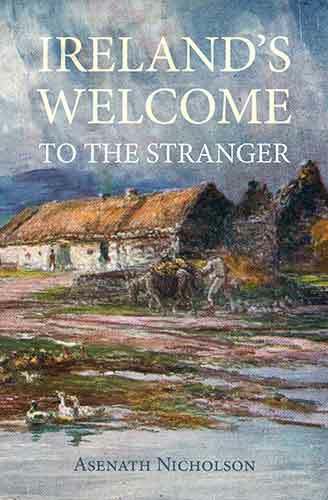 On the mountains of Turk and Mangerton, near Killarney, it is met with in great abundance; but its profusion in the neighbourhood of the Lee far exceeds all comparison." 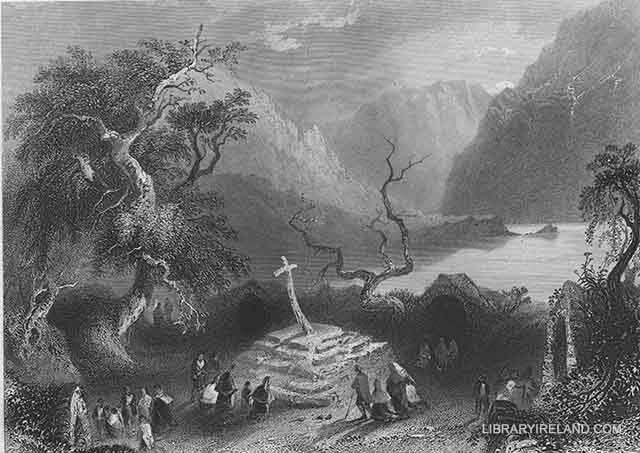 Having completed my examination of Keimaneigh, I began to retrace my route to Macroom, highly gratified with my visit to these romantic scenes; which, had they been found in almost any other part of Europe, would have been a favourite pilgrimage for those lovers of the picturesque, who haunt the Rhine and traverse the Alps in search of nature in her wild and beautiful solitudes.